Boston, get ready for some one awesome musical night! Happening on July 9 at Naga Club n Lounge is Music 4 Peace! 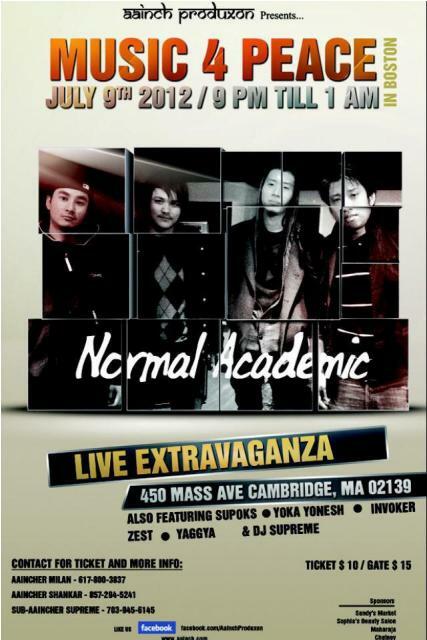 A presentation of Aainch Produxon, the concert will feature popular rock outfit from New York, Normal Academic. The boys are set to perform some of their old and new songs and also watch out for their tee-shirts which they’ll be giving out as freebies. The event will later see performances from Zest Band, Yaggya Band, Invoker band, Supoks, Yoka Yonesh and DJ Supremz (new DJ in town) will wrap up the show by spinning the hottest dance tracks. So if you’re searching for superb entertainment, you know where the fun’s at! The organisers and the bands would like to thank Gorkha Travel and Tours ([email protected], #347 468 7152), and Gharmai Record for their support. Tickets are available at New bombay market for an advance purchase fee of $10 and for $15 at the door.